You will get to taste many different types of Spanish food and tapas and some of the most secret place to eat. Your local Madrilenian guide will take you to an authentic pastry shop that opened more than 160 years ago! 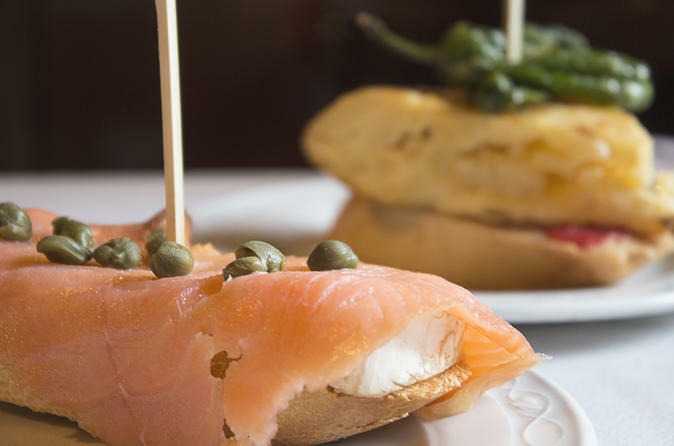 You will visit to a 100% authentic Spanish bar to try one of the most typical dish of Madrid. Then you will to a gourmet market which has been running for more than a century to try two delicious tapas and try some Spanish cider (the true Spanish way). You will sit-down at 2 restaurant stops to eat some mouthwatering dishes and some of the best tapas you can find in Madrid. The tour finishes with the famous Iberian ham. A must-do if you are in Madrid. Each and every Spaniard grows up surrounded by a rich food culture, furthermore, we are always overjoyed to introduce to any visitor the greatness of the food scene that our city has to offer. Spain is internationally well known for its gastronomy and its innovative and prestigious chefs, due to this reason, we are proud to have created for you an incredible experience mixing history, culture and the culinary art the city is known for. Our team will be dedicated to guide you through family-run businesses and local restaurants explaining you what to eat, why and how it is made. Meanwhile, you will experience the authentic Madrilenian lifestyle. We have absolutely no doubts that you will fall in love with them.